The best content does more than simply populate your website and improve its rank. High-quality content builds loyalty and helps you become a resource for your target audience. But in order to reach the pinnacle potential quality of your content, you need to refine it, hone it, polish it, until the words flow and the ideas pop. How do you go about that process? Through editing and revision. Don’t cringe, it’s okay. 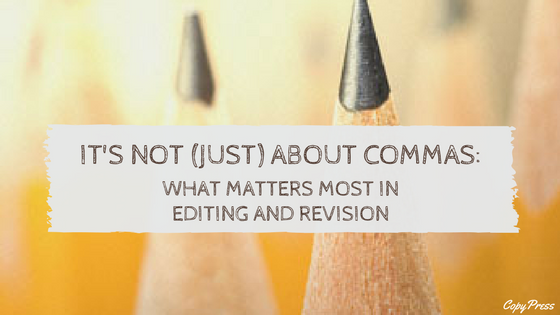 Editing is much more than your Facebook friends correcting your grammar or word usage. It’s much more than when to use a comma or (gasp!) a semicolon. It’s more than knowing when to use who or whom, or me or I. Instead of thinking of editing as stingy social media friends and confusing rules, think of it as a filter that will transform your content for the better. Even if you outsource your editing, you need to ensure that those editors are doing their jobs. In the end, you’re the final editor, so here’s what you should worry about most before sending your content off for publication. Yes, your content should be free of spelling errors, and it should use punctuation correctly. It’s helpful to be familiar with the basic rules of grammar and punctuation, or at least to know where to look for answers. Resources like Grammar Girl provide quick, easy-to-understand solutions to many problems you may encounter while editing. But as mentioned above, it’s not all about commas and semicolons. Where writing is often seen as a creative, transcendent process, editing is often viewed as a stiff and mechanical necessity. Grammar, however, is usually quite malleable, and editing can become just as artistic as writing. Some rules may be solid, such as placing determiners before nouns (the car, not car the), but others are fluid. Scared of putting a semicolon at the end of that phrase? You don’t have to. 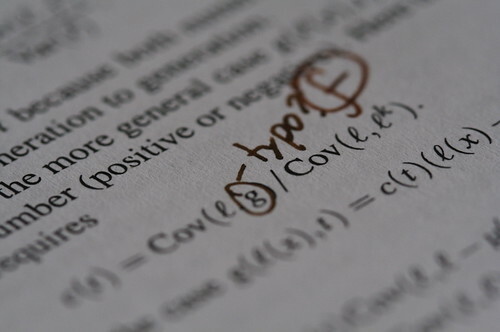 Use an em-dash or a parentheses (in most cases). Editing is full of choices. It’s often not about what is correct or incorrect, but what is best in the context. Since editors can make a number of decisions in order to maintain consistency, many businesses use a style guide that directs edits, and offers rigid guidance when options are on the table. For example, most online content follows the Associated Press Stylebook (commonly referred to as AP Style), but businesses sometimes amend AP in favor of other decisions, and outline those decisions in their own style guide. Adhering to a certain style throughout your content creates consistency, which improves the quality of content and reinforces your brand. Most users don’t come to your website to read a novel. They want quick, dense content that delivers what they need in as little time as possible. That puts the responsibility on you to ensure your content is as brief as possible without sacrificing valuable information. Sometimes this process can be difficult, but brevity asks that you cut everything from your content that isn’t absolutely essential. It’s less about keeping anything that could be considered useful, and more about preserving the best copy. By the time you’re finished revising a sentence, it should read like it couldn’t be written any other way. Cutting nonessential information and saying more with less will keep the emphasis on the most important pieces of the content. Brevity also carries over into paragraphs. Especially in website copy, where users expect a quick read and minimal effort, dense chunks of text will be more distracting than helpful. Keep paragraphs as brief as you can, but retain a unity of information. In order to create brevity, start by cutting fluff. Unless it’s essential to the tone or meaning of the sentence, cut filler words and unnecessary adjectives and adverbs. Many writers and editors refer to this process as “trimming the fat.” If paragraphs are too long, break them up. Turning paragraphs into lists can also help improve readability. You have a dictionary full of words at your fingertips. A single word can have a handful of synonyms that mean virtually the same thing, so how do you choose? The language you use in content should be primarily determined by your audience. If you expect every visitor to your website to be savvy with your field, you can use jargon that would cause any other reader’s head to throb. But if you want to expand your audience to those less familiar with the nooks and crannies of your field, avoid jargon at all costs. In addition to knowing what language your audience will understand, editors should always be aware of biased language. That includes anything that could be considered sexist, racist, or prejudiced in any other way. We don’t use policeman in writing anymore; we use police officer. You should also refer to minority groups by their preferred name. Don’t assume you know. Look it up. Biased language will alienate members of your audience and it’s just a no-no. Of all the important points to hit while editing content, clarity is arguably the most important. Brevity, language, style, and other editing factors contribute to clarity by focusing information and making it more accessible to the reader. Users should not usually have to read a sentence more than once to glean its meaning. They shouldn’t be thrown off by clunky sentence structure or unfamiliar language. Your content is pointless if it’s unclear. Maintain clarity by recasting sentences that feel choppy, and by being aware of your audience experience with your content’s topic. You should also build a coherent logical flow, where you move from familiar information to new information. Don’t let your reader get lost. These few factors are not all you should consider while editing, but ensuring adherence to style guidelines, brevity, understandable and fair language, and clarity will help you craft content that will connect with your audience and fulfill its purpose in your strategy. Editing takes patience, a careful eye, and awareness, but take the time to refine your content and you’ll have an edge on your competition.